This project was part of the "CS 8803: Mobile Applications and Services" Class at Georgia Tech. 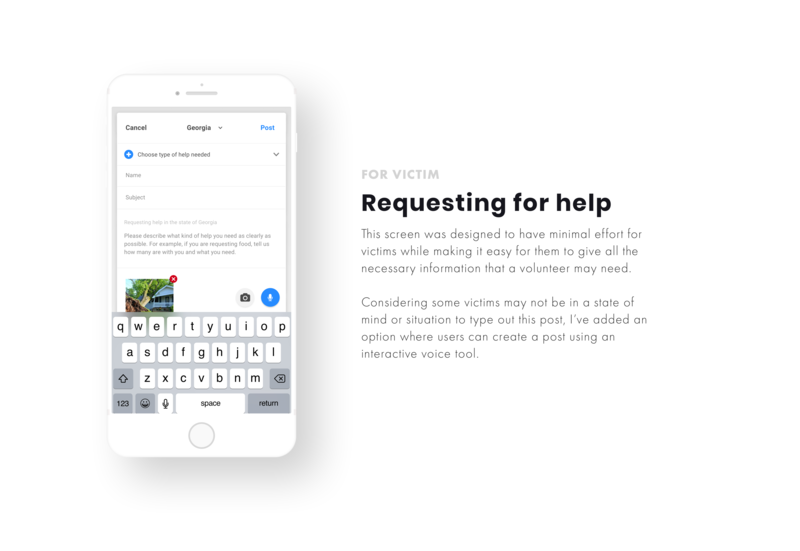 The goal was to design and build an app that helps victims and volunteers communicate for help more effectively. 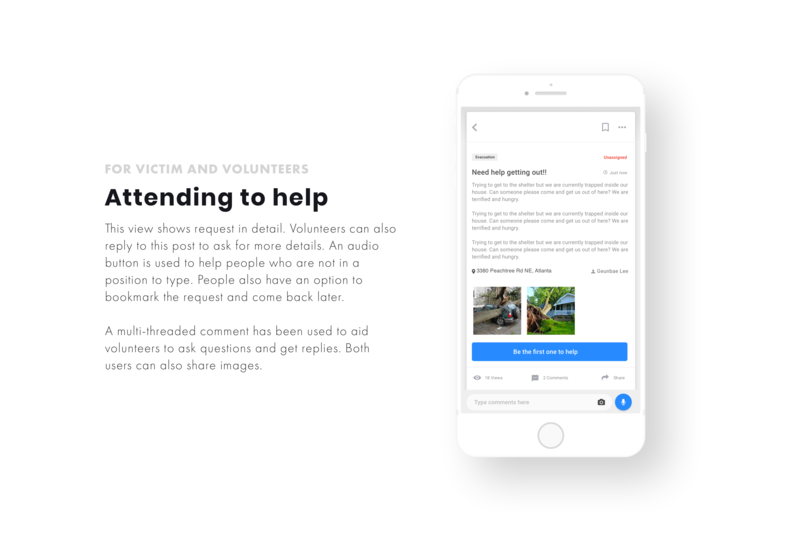 Using the app, victims can request for help, and volunteers/NGOs can reach out to victims to provide help. 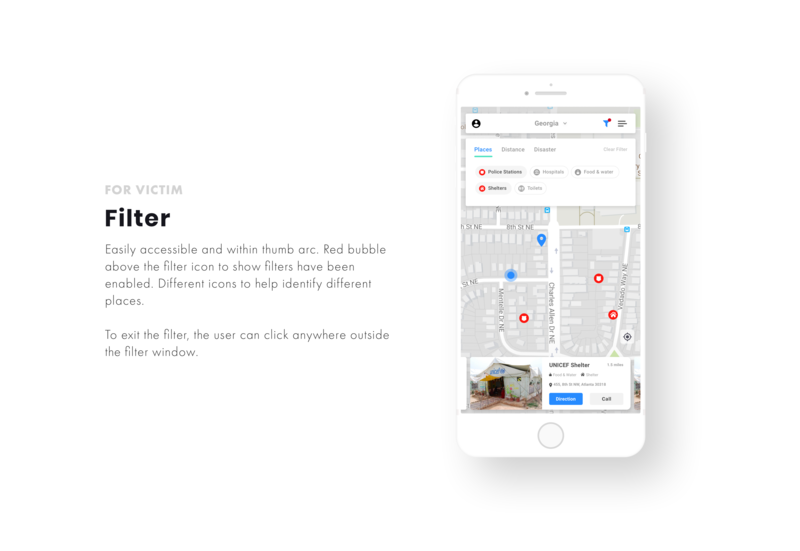 When a user creates a request for help, the message is broadcast to other users within a certain mile radius. These requests can be for food, shelter, clothes and so on. Any user within that specific radius can respond to these requests. During a disaster, internet access is often not available as well. 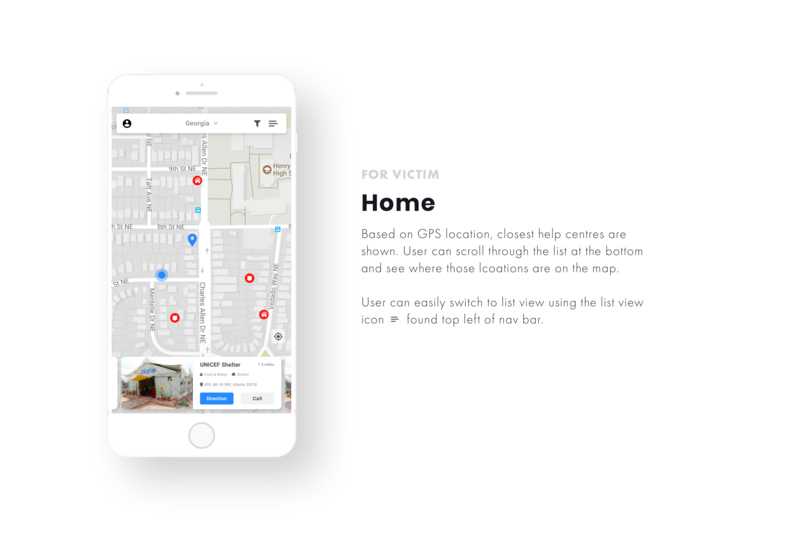 The app lets users identify the closest shelter, hospitals, restrooms, gas station etc. too, offline. 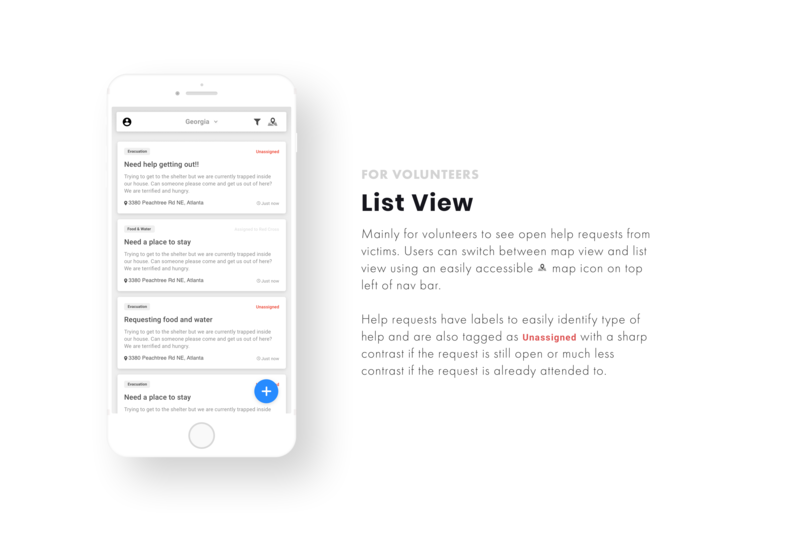 Most apps available in the marketplace today help share information about a disaster. But none are targeted towards post disaster communication, to give and take help. 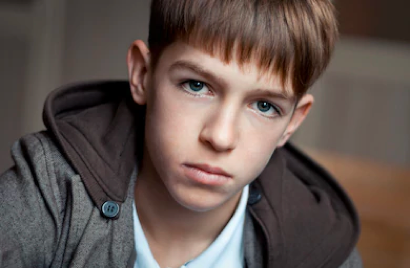 We took note of things that they thought of doing first, what their concerns were, who they reached out to, and how they got help. We also spoke to NGOs and volunteers to learn more about how they found victims, and co-ordinated with other volunteers. 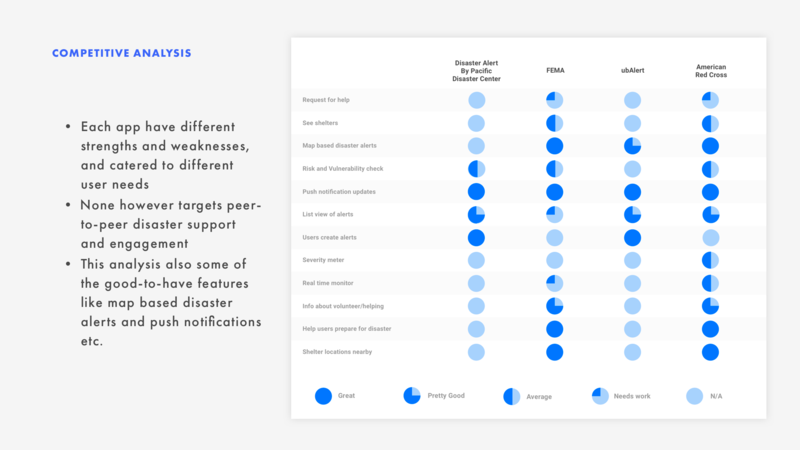 We found that each app had different strengths and weaknesses, and catered to different user needs. It also showed us what some of the 'must-have' features were for our product. Feels like help is unattainable or far away. Assumes that help is for select few or is not willing to ask for help. Will people of the same disaster affected locality empathise with each others needs better and be more likely to come forward to help each other? Participants also wanted in some way to verify that the volunteer is genuine (not dangerous). We’re still figuring out how to do this. One consideration is that we include social indicators like "You have 3 friends in common", or "Works for RedCross". People felt they might be representing multiple organizations, and wanted an option to switch roles. We have added this to our design. A participant quoted "I was not able to type properly.. hands were trembling" -> this learning led us to design an interactive voice response feature, to create and respond to requests. We also felt this would be a good accessibility feature for the app.